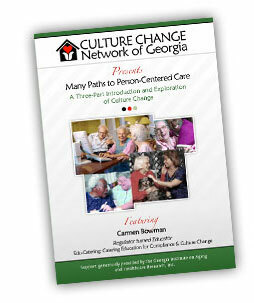 Many Paths to Person-Centered Care is a three-part introduction and exploration of Culture Change. It is an excellent educational tool for all staff, in-service training sessions, residents, families, boards and the greater community. 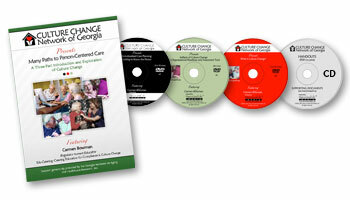 Handouts and training materials are included on a CD for easy-to-print tools you can share with all audiences. Everyone deserves the opportunity to learn about Culture Change! PRESENTER Carmen Bowman, MHS was a Colorado state surveyor for nine years, surveying nursing homes, assisted living residences and adult day programs. She was a policy analyst with CMS where she taught the national CMS Basic Surveyor Training Course. She now works as a contractor to CMS, and co-developed the Artifacts of Culture Change tool. Carmen facilitated the Creating Home national symposium in 2008, which explored the environmental requirements and Culture Change. She is the owner of Edu-Catering: Catering Education for Compliance and Culture Change in long term care, which provides Culture Change consultation. Carmen is a nationally-recognized expert in Culture Change and is a frequently invited speaker at national industry conferences. Buy the individual DVDs below! This presentation is an introduction to the national culture change movement and the Pioneer Network. It includes a brief review of the Eden Alternative, the Regenerative Community, Bathing Without a Battle, and the Neighborhood, Household and Green House models. Outcomes from leading Pioneer homes are described, as well as success stories of changing the institutional culture without spending any money. Embracing culture change over the aging services continuum, national and state initiatives, and resources are also shared. Artifacts of Culture Change is a culture change measurement tool designed to help organizations document the concrete changes they are making to “create home” and find out how “culture changed” they’ve become. 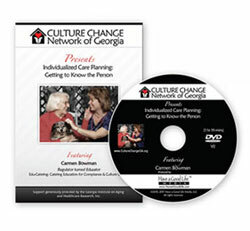 Learn how to use the Artifacts tool, and become aware of culture change practices that may not have been considered as you shift your focus from “institutional” to “individualized.” Although this tool was developed for nursing homes, all settings can get great ideas to help reframe their focus on person-centered life!